Thiruvananthapuram: Two days after the Kerala government said it was open to any probe, even one by the Central Bureau of Investigation (CBI), into the murder of a Youth Congress worker in Kannur, chief minister Pinarayi Vijayan on Monday said there was no need for an investigation by the central agency. Unhappy with Vijayan's statement in the assembly on the murder of 30-year-old Shoaib in Kannur on 12 February, the entire opposition went into protest mode, forcing the Speaker to adjourn the House for the day. As the Kerala Assembly began its session on Monday at 8.30 am the Congress-led opposition walked into the House wearing black badges. When question hour began, the party demanded suspension of House proceedings and a debate into Shoaib's murder that took place at an eatery near Mattanoor four persons in a car hurled bombs and then fatally injured Shoaib, slashing at him with a sword. But Speaker P Sreeramakrishnan was in no mood to relent, worsening the situation as angry opposition members trooped near the Chair's podium and shouted slogans. Sreeramakrishnan was then forced to adjourn the House. When the House resumed at 9.30 am, Sunny Joseph, senior Congress legislator from Kannur district, moved an adjournment motion and said that the CPM has delivered "the unkindest of all cuts" on Shoaib an active Congress worker. "It took six days for you (Vijayan) to react on it. The Director General of Police has already gone on record to say that the accused are CPM workers. "The first and second accused in this murder case are already accused in another murder case, but you (Vijayan) were silent on it. "Instead, you pointed out Sohaib was arrested in a street fight case. The pictures of Shoaib that have come out now show how brutally he was butchered," said Joseph. 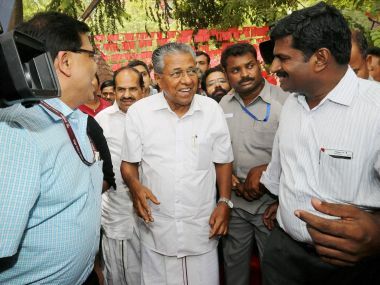 Vijayan, replying to Joseph, pointed out that no murder can be justified and said that the overall situation in the state has improved compared to the previous years. "The police have been doing a smart job and have arrested five people, and the probe is going in the right direction. So, at the moment there is no need for a CBI probe," said Vijayan. Soon, Leader of Opposition Ramesh Chennithala also stepped in and said that it was just two days back that, at an all-party meeting in Kannur, minister for SC and ST and Culture AK Balan had categorically said that the state government was open to any probe, even a CBI probe. "Now, you (Vijayan) say the CBI probe is not needed. The smell of blood on the hands of the Communist Party of India-Marxist in this murder will not be washed away even if you use all the perfume in the world. "The very fact that you have gone back on your assurance of any probe clearly indicates that you have things to hide. This is not acceptable and we will protest till you announce a CBI probe into this murder," said Chennithala. Following the speech, angry opposition members stepped up their protest, forcing the Speaker to adjourn the House for the day. In Kannur, Shoaib's father told the media that it's imperative to know why his son was killed. "He (Shoaib) did not know any of the five accused who have been arrested and hence it is very clear that this was a planned one. We want to know the reason why my son was killed," said Shoaib's father. Senior Congress leader K Sudhakaran, whose fast in Kannur demanding a CBI probe entered the eighth day, said that the "cat is now out of the bag and Vijayan knows that if the CBI is entrusted with the job of probing the case, then the law will catch up with the Kannur district leadership of the CPM, which is alleged to have masterminded this murder".